Take control of your meeting room reservations by using your existing calendar systems and improve and streamline your work-flow. Make an impact on employees and visitors with our sleek touch screens and way-finding solutions installed in your office locations. In control. 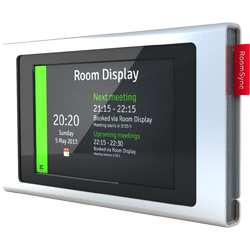 Room Sync with Room Display 5 software is a professional, ultra-modern meeting room digital signage system that puts you in control of your room reservations. It can be used to manage room bookings via the email calendar or the convenient touch-screens outside each meeting room, and present a wide range of customized information including availability, organizer, title and upcoming events. Contemporary design Room Sync is an elegant touch-screen door sign for all your meeting rooms. Designed in Sweden, the sleek anodized aluminium body, combined with black glass effects and stylish wool felt accents lend an air of distinction to Swedish elegant simplicity and functionality. All at an unbeatable price. 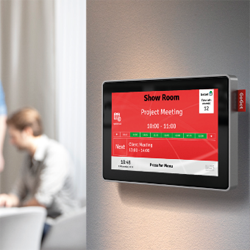 With the all-new 11-inch Room Sync Plus, we have produced one of the most comprehensive meeting room display systems available today – equipped with extra everything. From the inside out, this new meeting room display is equipped with some nice features that will make the day at the office a little easier and more joyful. 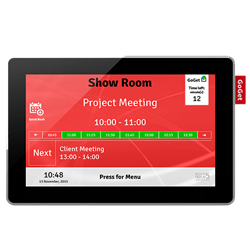 All-new Room Finder for Room Display 4 & 5 is a professional, modern and cost-effective way finder solution ideal for offices with multiple meeting rooms. 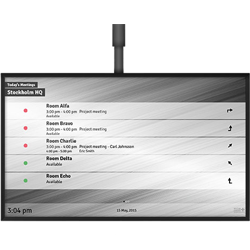 It displays easy-to-read meeting room information and directions for all visitors and meeting attendees on LED-TVs in reception areas, lobbies and other office areas. It enhances and supplements the GoGet Room Display system. 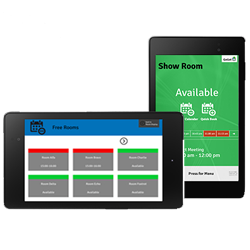 Room Display can fully sync with Microsoft Exchange and Google Apps, giving you and your users the flexibility to reserve rooms from any location and any device—no extra software needed! Unlike many alternatives on the market, Room Display integrates seamlessly and effortless with most IT-policies. We believe that our customers should have the freedom whether they want to buy a complete meeting room display unit with support, or create their own software/hardware bundles. Our license-only option offers full customer flexibility for those organizations who prefer to configure a tailored solution.